SUMMARY: While the MarketingSherpa team is at Summit 2016 this week, we continue to explore the results of the 2015 MarketingSherpa Consumer Purchase Preference Survey. Read on to discover how customers want to receive regular updates and promotions, and how it compares to the tactics marketers use to engage customers. As you may already know, at MarketingSherpa we have conducted two surveys — a marketer survey and a consumer survey — looking to compare what consumers say they want and what marketers actually do, to help us build content for MarketingSherpa Summit 2016. This week we take a look at the ways customers want to receive regular updates and promotions from companies, and compare it to the ways marketers offer to customers in order to engage them with brands. We asked consumers, "In which of the following ways, if any, would you prefer to receive regular updates and promotions from companies that you are interested in doing business with? Please select all that apply." After summing up the numbers of consumers who prefer email at a frequency chosen by themselves and email at a frequency set by brand, email emerges as the most preferred way to receive updates and promotions (60%). We asked participants to "Select all that apply," which allowed them to pick more than one option. The total number (60%) reflects unique responses. 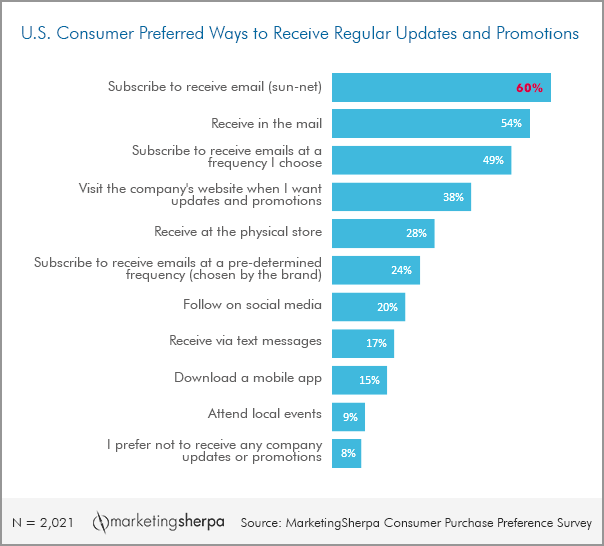 Notably, subscribing to receive emails at a frequency consumers choose is twice as popular (49%) as subscribing to receive email at a company's pre-determined frequency (24%). Email is perhaps unexpectedly followed by snail mail (49%), leaving visiting the company's website in third place (38%). We also asked 455 marketers, "What ways do you offer for customers to engage with your brand? Please select all that apply." Marketers chose their answers from similar options as consumers, rephrased to reflect a marketer perspective. Consumers' strong preference to receive email at a frequency they chose (49%) was less popular among marketers (14%). Another top choice of customers, receive updates in the mail (54%), was less popular among marketers (19%). Customers' third most preferred method, visiting the company website (38%), was also less popular among marketers. Only 8% of marketers said they posted updates on websites and did not contact customers directly. Inviting customers to follow their brands on social media was the top choice among marketers (77%). In contrast, only 20% of consumers favored this method. Sending subscribers email at a predetermined frequency was the second top choice of marketers (76%). In comparison, only 24% of consumers favored this method. Attending local events was the third top choice among marketers (36%). In contrast, only 9% of consumers preferred this method. To sum up, marketers' practices of ways they offer to customers to engage with brands are lagging behind consumers' top choices of ways to receive updates and promotions. People prefer to choose how frequently they receive email from marketers, while marketers overwhelmingly offer to subscribe consumers to email updates at a predetermined frequency. People prefer receiving print updates in the mail more than marketers tend to offer. People also prefer to just visit the company website to get updates and promotions, without being contacted by marketers, while marketers are not that willing to use this seemingly laissez-faire method of customer engagement. To the point of giving customers a choice in email frequency — email subscribers might already be taking the power to choose for themselves. Marketers who send email at predetermined frequencies might not have subscribers' attention for every send.